A year ago, Phillip Torrone wrote in MAKE: "Very soon, credit card companies and game makers will reward their customers who spend money in the real world using private label "rewards" credit cards. They will use gifts of virtual currency such as Blizzard's World of Warcraft gold and Second Life's Linden dollars." 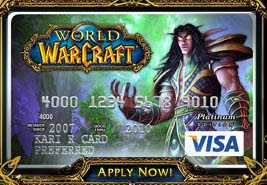 Now, Visa teamed up with Blizzard Entertainment, the makers of World of Warcraft, to offer a credit card that rewards WoW players with playtime if they make a qualifying purchase: "for each $1 spent on their WOW Visas, players will get $0.01 credit toward their $14.99 monthly subscription fee" (GameSpot). QJ blog reports there are still some wrinkles to be ironed out: "The sign up page asks players to enter their WoW account names, but an error pops up if account names have a number on them. The error: Please enter only Alpha characters for your World of Warcraft Account Name. But if players chop the numbers off their account names, it wouldn't be theirs at all." Visa in "The Game of Life"